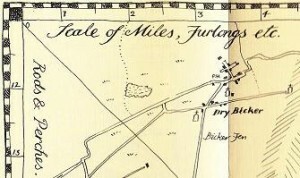 Both as an area and a village, Grunty Fen is a notoriously unstable place. The picturesque olde worlde character of most neighbouring villages can be guessed from their names: Rat Dyke, Foul Fen, Dank, Guttering, High Camp, Down Market, Wrath, Snare, Dry Bicker, Scab, The Nackers, Scum, Crudely, Blight Fen and Great and Little Harm. Some villages are still being discovered or created. Bottle Bank, for example, has sprung up around a refuse disposal dump. At least one village actually migrates from place to place within the fen. 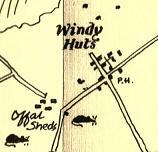 Windy Huts is a lawless place inhabited by ruffians chiefly employed in the local industry at The Offal Sheds. See Places of Employment. For Pious End, see Religion. There’s more about the villages of Grunty Fen – including the peripatetic – on Crattendune from the album Archive Editions 2. If you’d like a map of the area (see right), please go to Dennis’s shop. The map, from which many of our illustrations are taken, was drawn by renowned artist John Holder and is a delight to behold, being full of wonderful detail and covering an area from the lower limits of the Great Rhubarb Forest to south of the village of Gt Harm. For John’s own website, please click here.